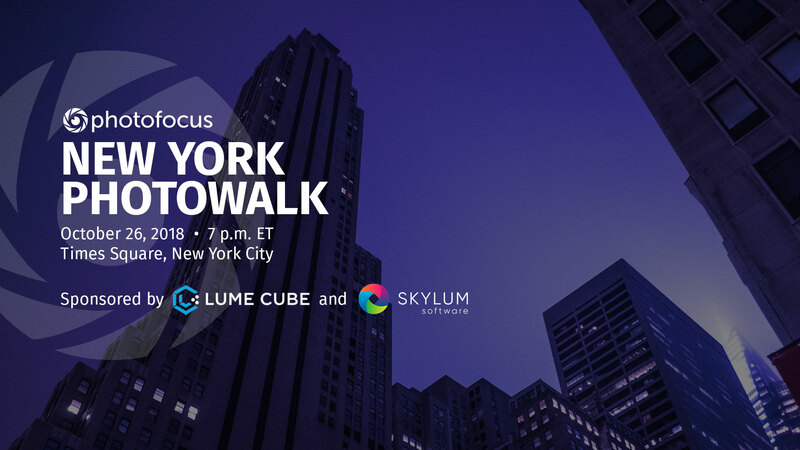 Tonight’s the night — join us for a NYC photowalk! We hope you can join us tonight, Oct. 26, for a New York City photowalk! We’ll start in Times Square, help each other make great pictures and have a fun time in the Big Apple. We’ll begin in Times Square and venture upon some of the iconic places within walking distance. We’ll have trial units and prizes from our friends at Lume Cube to help us make pictures like never before. We’ll use these to photograph buildings, people — even cops — as we walk around. Several of our Photofocus authors and publisher, Richard Harrington, will be there. We hope you can join us! We’ll also have prizes from Skylum — makers of Luminar and Aurora — and Athentech — creator of Perfectly Clear, along with a few more surprises. Meet us in Times Square at the foot of the red stadium seating by the statue of Father Duffy. I’ll be wearing a fedora and bowtie. Everyone is welcome, so bring your non-photographer with you. Your camera with batteries and memory cards ready to go. Bring a Platypod if you have one, or bring a tripod head and borrow one of mine. Don’t bring tripods or light stands (they cause trouble at some of the spots we’ll shoot). Consider bringing just one or two lenses and traveling light. Dress for cold weather, as we’ll walk for at least an hour outdoors. And special thanks to Lume Cube and Photofocus for making this photowalk possible. If you’re at PhotoPlus Expo, be sure to drop by the Lume Cube booth, #768, to see all they have to offer. They’re offering 10% off on all products with show special bundles up to 20% off. Register for our photowalk in New York City today!